Not “culturally relevant,” but culturally empowering. My sixth grade teacher was the only Black male educator in our entire school system when I had him as an eleven year old. In my racially and economically diverse elementary school, virtually all the Black children in each grade were put into his class every year–a fact which as a young student upset me. Once I was placed in his class, however, I immediately saw the profound power and unique value of having a dedicated, veteran teacher who shared my racial and cultural identity. While I do not believe that Brown teachers are inherently better suited to teach Brown students, I do believe that the mark of a good educator is an awareness of the skills and experiences which they can and cannot bring to the communities with which they educate, and how to make both relevant to the lessons they teach. My sixth grade teacher exemplified this. The most powerful knowledge he invested us with was always delivered outside of the prewritten lessons—during breaks before recess or while we were eating lunch in the classroom. While he was an expert math, reading and writing instructor, what I remember more than anything else were the informal lessons he taught us on Black slang. During open moments in the daily schedule, he would stand at the board and write down words from his own vocabulary, or words that he had heard members of our classroom community using, and ask those who knew to define them. He would speak at length about the slang of his generation as compared to ours, drawing links between the evolution of different words and phrases over time and geography. This seemingly offhanded exercise was extremely changing for me, not only because it taught me the scope and power of the language of my people, but even more so because as a middle class Black person, much of the slang we discussed was new to me. I did not know many of the dialects my peers spoke, and was often teased for being outside of the cult of true Blackness. Learning slang gave me a new way to relate to and communicate with my friends, and taught me solidarity with other people of color from classes different than my own. Most of the debates in education circles about the use of vernacular language in classrooms focus on whether or not its use helps students learn traditional subjects better. 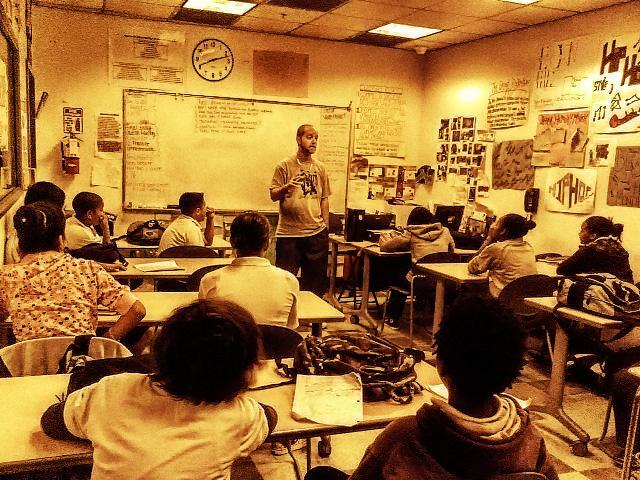 From bilingual to hip hop education, the discussion often seems to boil down to the question of whether teaching Black students math in Black slang makes them do better in math, or whether teaching immigrant students in their original languages helps them grasp the basic concepts which all students in an industrial learning model are expected to grasp. It is only the most radical educators, I have found, who use slang pedagogically to ask deeper questions: Is the power of slang not to trick young people into learning what the school system originally wanted them to learn, but to point to the barrenness and irrelevance of traditional learning to their lives as oppressed people? Can we use the languages of our communities not to bolster traditional subjects, but to break them down, reveal them as disjointed both from one other and from our own experiences of the world? These questions can be linked to a host of other debates and dilemmas in the field of education. The fact that my sixth grade teacher taught us these lessons literally outside of the traditional curriculum may have been because he had a few extra minutes he needed to fill, or because he wanted to make his classroom unique and exciting, and had found a “culturally relevant” way of doing so. Yet what he had learned to do as a teacher within the larger system of schooling is exactly what all our vernacular traditions do–find spaces in the structures we are forced to inhabit, made to rely on to communicate and engage one another, and embellish them, fill them with our own ideas, passions and needs, until those structures are not merely undermined, but transformed into something almost unrecognizable. Trusting these traditions, and making them an integral part of our learning communities is not culturally relevant but culturally empowering learning, and a means of dismantling traditional education. It reminds us that the most valuable lessons cannot be guaranteed to take place at a certain time, in a certain space, or resulting in the accomplishing of a predetermined skill. It teaches us that we alone determine what matters most to us, what we need to learn, and that no matter what demands are made of us, we have the power and creativity to implement it. ← Where Are Queer Cis* Men in Radical Activism? I think using slang in the classroom is also a good way to introduce students to the idea that “academic speak” is another way of using the English language, just as slang is. Many students imagine (incorrectly) that academic speak is the sophisticated/ smart/ correct way people talk with one another. By posing slang and Academic Speak as different shades of the English language, rather than as a bipolar correct/incorrect dichotomy, students can become empowered to use the language of academics. By using the language of academics students can better question the system of schooling itself. Since schools talk in academic speak, there is (in my mind) no better way to change the system than to know it and speak it yourself. I really like your idea of talking about dialects, showing multiple forms of expressions and communication as valuable and useful, and breaking out of a correct/incorrect dichotomy. I agree with you that this is especially useful in pointing out what we are all taught to believe about “right” and “wrong” uses of language, where those lessons come from, and whose vision of expression they support. Where I might push back is with the idea that we need to learn academic speak necessarily if we are to take down or transform the academy. In my mind, slang and its uses are reminders that the forms of expression which are labeled as “inaccurate” can have the most accuracy in illustrating and validating our lives and perspectives, in the face of systems which only want us to learn what is necessary for their own maintenance. I would like to encourage students to use all available tools to dismantle those systems. I would agree with you that slang is one of the most useful tools in combating the academy, and can be particularly useful, as you put it “in illustrating and validating” students’ “lives and perspectives.” I think an important aspect of teaching vernacular is validating students’ experiences and cultures. Students need confidence in themselves to feel strong enough to question what they know to be truth. Additionally, their experiences deserve to be validated from a moral standpoint. My point that “by using the language of academics students can better question the system of schooling itself,” was more that institutions respond best to change they recognize. Often institutions react strongly against change that they feel comes from an ‘other.’ Hence, in my mind, the best way to create institutional change is to use the tools of the system itself. By cloaking my language in academic speak, I can make my terms seem more appealing and more reasonable to the academy. I guess I see the academy as an institution that needs change, not complete dismantling, and the best way to instate that change is through convincing the academy itself that it should change. You bring up an age-old and complicated question, which I definitely appreciate. Whether we see justice as coming from the academy’s changing or from its ceasing to exist may be another, longer discussion. I do, however, invest little faith into trying to convince any systems of oppression–in which I include the academy–to change their ways. Logical appeals are difficult to present to illogical structures. Independent action, on the other hand, puts power in the hands of our communities, and focuses on us rather than the bodies which devalue us. I think recent battles around Ethnic Studies illustrate this point well for the field of education. Instead of trying to convince institutions which have already established us as “others” of our humanity, I would rather work with those of us who are on the outside in establishing the kind of empowered learning which we feel education needs to consist of. This, I recognize, may be a longer struggle, and a deeper question than that of the type of language used in the classroom. Thanks for your quick replies to my comments! I appreciate the amount of thought you’ve put into them, and also your blog posts. Although we have differing views of HOW to make change, or what that ultimate change may look like, I definitely appreciate your perspective on what kinds of change need to happen, and why. I look forward to reading through some more of your articles, in whatever free time I have while at college. Look for me in the comments.